Day 4’s inspiration came from an overwhelming amount of oranges and a love of goat cheese. I was looking for recipes that called for oranges because I have a ton of them – a couple days after buying a massive bag of orange’s from Costco, I also got a shipment of 12 oranges from my Aunt in Florida. Love having so many oranges, but I have to get creative. I found a recipe for “Orange, Roasted Beet, and Arugula Salad” in my cookbook, Fresh Flavor Fast from Martha Stewart (thanks Mom!). 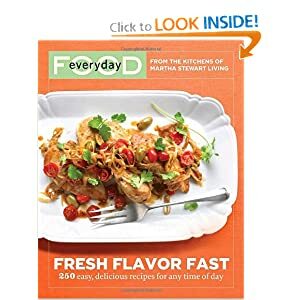 As a side note, this cookbook is rated 4.5 stars on Amazon and I absolutely love it. It has really simple ingredients that make really delicious, impressive food. Add one packet (20g) of Sodium Alginate to 2 cups of cool water. Mix with your immersion blender (or put into a standard blender) and let sit in the fridge for 15 minutes. Add 50g of goat cheese to a bowl. I used a converter and this is 1.7 ounces. The standard goat cheese log is 4 oz, so I tried to use about a little less than half of the log. Then, add 1 tablespoon plus one teaspoon of milk. Sprinkle 1/2 teaspoon of Calcium Lactate over the milk/goat cheese, and stir together thoroughly. *Note that my globes were not runny at all. I had to use my finger to push the mixture out of the teaspoon. This made the effect much less impressive because they were more blobs than dollops. Without a bit of fluidity, they didn’t take on a very cool shape. I am not sure how to remedy this – maybe more milk and more calcium lactate? Using a half teaspoon, scoop up the goat cheese mixture and drop by the spoonful into the alginate solution. Note that I thought a half teaspoon ended up being fairly large. If I made these again, I would use a quarter teaspoon. Let sit for three minutes, then give the globes a rinsing bath in a bowl full of cool water. Goat cheese globes were far from the coolest thing to make. These were really easy, but just not very impressive. Goat cheese can already form crumbles on their own, and without any sort of fancy shape, I could have had a similiar result by just slicing the cheese. I did like have more of a fluid cheese on my salad though. If you don’t want to use canned beets, you need to cook your beet. To do so, preheat the oven to 450*F. Wrap the beet tightly in aluminum foil and place on a baking sheet. Cook until tender when pierced with a knife (about 45-50 minutes). When cool enough to handle, peel (rub off the skin with a paper towel so your hands don’t stain) and cut into wedges. That seemed like a lot of work for just one beet, which is why I choose to use canned beets. They come presliced, so you just open the can and you are good to go. Over a bowl, cut the ends off both the oranges. Then cut in half again (see picture). After that, peel and wedge the oranges. Squeze the juice out of the ends of the orange that you cut off. You are trying to salvage some orange juice for the dressing. Mix together oil, vinegar, mustard, and orange juice. Add salt and pepper to taste, then whisk to combine (I just put mine in a little container and shake). If you do not have enough orange juice, just squeeze the juice out of a few of your orange wedges. Toss arugula with dressing from Step 3. Divide among four plates (or two if this is a dinner salad), top with beets, oranges, and goat cheese globes, plus cauliflower if using.